Use for our 420 Dabs is about half the size of a grain of rice, under the tongue or inhaled with the use of a wax vaporizer. You may notice something different about our newest product – it’s a wax! But that doesn’t mean that it’s lost any of its health benefits. It is a highly concentrated form of CBD. It is made from 100% legal hemp oil extract. Our all natural CBD Oil infused 420 Dabs are made from real cold pressed industrial hemp. Cannabidiol (CBD) is a naturally occurring constituent of industrial hemp/cannabis. Our CBD oils and wax dabs are derived from industrial hemp, so they could be considered CBD-rich hemp oil, hemp derived CBD oil, or CBD-rich cannabis oil. Our CBD Hemp Oil is processed to within .001% of purity and contains 180 or 240 MG of organically grown and pressed Cannabidiol Wax. 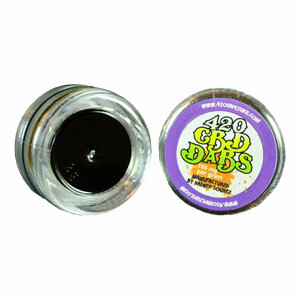 ‘CBD wax’ is a cannabis oil that has significant amounts of cannabidiol (CBD) contained within it. It is similar to hash oil with the same characteristics but Instead of having THC, our dabs have THCA and will not get you high. What makes it a Wax? Budder/wax are polycrystal phases. Saps are completely disorganized and still sappy because of excess solvent (many terpenes are also solvents) or water content(“solvatomorphism”). *Lipids can contribute although it is not clear the exact nature of which lipids cause which effect. We do know that many of the lipids are amphiphilic (can bond to both polar and non-polar.) The plant lipids play a role that is more complicated than previously thought. It is not why shatter shatters, but it does directly affect your THCA crystallization. Terpenes can also keep your extracts sappy; terpenes could be considered a “co-solvent” in the solution. Decarboxylation will also yield a sappier product. High CBD extracts also tend to be sappy as CBDA does not appear to crystalize and remains liquid. This is similar to the pseudopolymorphism that sugar exhibits when making candy. Sugar starts with the least ordered phase and progressively becomes more ordered. This process is analogous to the transformation of shatter into wax. In shatter, the cannabinoids (in their natural acid forms), terpenes and waxes are all mixed together in one phase and in a way that allows light to pass through the molecular structure, just like hard candy. When it becomes wax or budder, the cannabinoids crystallize around each other and separate from the terpenes and waxes. This mixture of phases does not allow light to pass through and can have anything from a dry crumbly texture to a peanut butter consistency. CBD oil is a solution of compounds found in the cannabis plant and many things can affect how its extract will turn out. As long as all the components of an extract are still in a single, homogeneous phase, the extract will be transparent. The different components will dictate whether the extract is hard, moldable or sappy. An extract with decarboxylated THC will be sappier and the same goes for extracts with high CBD. An extract that you can’t see through is different on a microscopic level than a transparent one. If you can’t see through it, that means the THCA and other solids have separated from the other components that are liquid, like terpenes. When light passes between two mediums of different densities, it gets refracted; multiphasic, amorphous solids are generally not transparent. Same goes for CBD oil (CBD Vape Juice). Once the extract is purged of the butane, you’ll generally have a shatter-like oil. Agitating the oil makes this into a wax, and agitation can come in a few different ways. Some people choose to raise their temperatures under vacuum (from 90°-110° or even 120°+) once they have achieved clean translucent oil. Some people choose to whip their oil and put it back under vacuum at the same temperature. And some just whip it and leave it alone. Any agitation will turn it into a non-transparent extract. Sometimes translucent oil will wax-up after being stored over a period of time. In this circumstance, the agitation is occurring either because of residual solvent trying to evaporate or because of terpenes trying to evaporate. The THCA molecules tend to crystallize by coming together, but the viscous nature of the oil slows this down. Still, it eventually happens to a lot of shatter at room temperature or higher. Wax Cannabidiol (CBD), like THC, can be heated and inhaled using a wax style vaporizer. This entry was posted in Featured Articles, News & Videos, Product Info. Bookmark the permalink.